I thought this would be a one day project but it is turning into a 3 day event. It was quite difficult putting in the tube insert. And there is not a lot of room between the rudder and the hull. 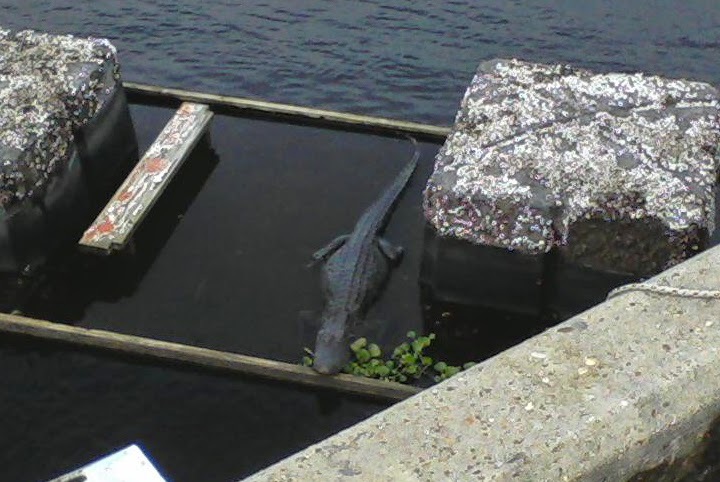 On a lighter note, our friendly pet gator here at the marina came out today to sun himself on an overturned dock. Dinner tonight was veggies and beans with my usual yogurt fruit concoction. I celebrated Fathers Day with a chin wag from the best 2 sons anyone could wish for. Tomorrow I am supposed to go sailing down the St Johns river to Jacksonville with another couple, Tina and Greg, so I am not sure if I will be back at the boat in time to post my blog. I wanted to check out the river first with a seasoned professional before I attempt it on my own.